The Story of Cinderella. The Original Classic Fairy Tale of Cinderella. The story of Cinderella was originally a French fairy tale called Cendrillon, ou la petite pantoufle de verre (Cinderella or the little glass slipper). It was first published in 1697 in a book written by Charles Perrault called Histoires ou contes du temps passé, avec des moralités (Stories or Tales from Times Past, with Morals). Interestingly, the first page of the book shows an illustration of an old woman spinning and telling stories with the words 'Contes de ma Mere l'Oye' (Tales of My Mother the Goose). 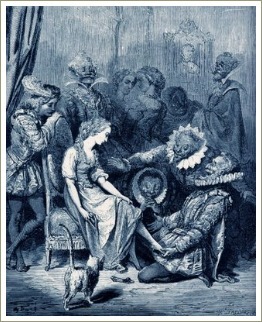 Although he was the first to publish the story, Charles Perrault didn't actually write the story of Cinderella himself. Like the other tales in his book, the story of Cinderella was already well-known in Europe as part of an oral tradition of story telling going back hundreds of years. But Charles Perrault recorded the story with wit and style and his book was an immediate success. It was quickly translated into English and, of course, we know that the English-speaking world loved the stories - especially the story of Cinderella - as much as the French did. The story on this page is the story of Cinderella in its original form, as translated from the story written in French by Charles Perrault in 1697. Once there was a gentleman who married, for his second wife, the proudest and most haughty woman that was ever seen. She had, by a former husband, two daughters of her own, who were, indeed, exactly like her in all things. He had likewise, by another wife, a young daughter, but of unparalleled goodness and sweetness of temper, which she took from her mother, who was the best creature in the world. No sooner were the ceremonies of the wedding over but the stepmother began to show herself in her true colors. She could not bear the good qualities of this pretty girl, and the less because they made her own daughters appear the more odious. She employed her in the meanest work of the house. She scoured the dishes, tables, etc., and cleaned madam's chamber, and those of misses, her daughters. She slept in a sorry garret, on a wretched straw bed, while her sisters slept in fine rooms, with floors all inlaid, on beds of the very newest fashion, and where they had looking glasses so large that they could see themselves at their full length from head to foot. The poor girl bore it all patiently, and dared not tell her father, who would have scolded her; for his wife governed him entirely. When she had done her work, she used to go to the chimney corner, and sit down there in the cinders and ashes, which caused her to be called Cinderwench. Only the younger sister, who was not so rude and uncivil as the older one, called her Cinderella. However, Cinderella, notwithstanding her coarse apparel, was a hundred times more beautiful than her sisters, although they were always dressed very richly. It happened that the king's son gave a ball, and invited all persons of fashion to it. Our young misses were also invited, for they cut a very grand figure among those of quality. They were mightily delighted at this invitation, and wonderfully busy in selecting the gowns, petticoats, and hair dressing that would best become them. This was a new difficulty for Cinderella; for it was she who ironed her sister's linen and pleated their ruffles. They talked all day long of nothing but how they should be dressed. "And I," said the youngest, "shall have my usual petticoat; but then, to make amends for that, I will put on my gold-flowered cloak, and my diamond stomacher, which is far from being the most ordinary one in the world." They sent for the best hairdresser they could get to make up their headpieces and adjust their hairdos, and they had their red brushes and patches from Mademoiselle de la Poche. They also consulted Cinderella in all these matters, for she had excellent ideas, and her advice was always good. Indeed, she even offered her services to fix their hair, which they very willingly accepted. As she was doing this, they said to her, "Cinderella, would you not like to go to the ball?" "Alas!" said she, "you only jeer me; it is not for such as I am to go to such a place." "You are quite right," they replied. "It would make the people laugh to see a Cinderwench at a ball." Anyone but Cinderella would have fixed their hair awry, but she was very good, and dressed them perfectly well. They were so excited that they hadn't eaten a thing for almost two days. Then they broke more than a dozen laces trying to have themselves laced up tightly enough to give them a fine slender shape. They were continually in front of their looking glass. At last the happy day came. They went to court, and Cinderella followed them with her eyes as long as she could. When she lost sight of them, she started to cry. "I wish I could. I wish I could." She was not able to speak the rest, being interrupted by her tears and sobbing. This godmother of hers, who was a fairy, said to her, "You wish that you could go to the ball; is it not so?" "Yes," cried Cinderella, with a great sigh. "Well," said her godmother, "be but a good girl, and I will contrive that you shall go." Then she took her into her chamber, and said to her, "Run into the garden, and bring me a pumpkin." Cinderella went immediately to gather the finest she could get, and brought it to her godmother, not being able to imagine how this pumpkin could help her go to the ball. Her godmother scooped out all the inside of it, leaving nothing but the rind. Having done this, she struck the pumpkin with her wand, and it was instantly turned into a fine coach, gilded all over with gold. She then went to look into her mousetrap, where she found six mice, all alive, and ordered Cinderella to lift up a little the trapdoor. She gave each mouse, as it went out, a little tap with her wand, and the mouse was that moment turned into a fine horse, which altogether made a very fine set of six horses of a beautiful mouse colored dapple gray. Being at a loss for a coachman, Cinderella said, "I will go and see if there is not a rat in the rat trap that we can turn into a coachman." "You are right," replied her godmother, "Go and look." Cinderella brought the trap to her, and in it there were three huge rats. The fairy chose the one which had the largest beard, touched him with her wand, and turned him into a fat, jolly coachman, who had the smartest whiskers that eyes ever beheld. After that, she said to her, "Go again into the garden, and you will find six lizards behind the watering pot. Bring them to me." She had no sooner done so but her godmother turned them into six footmen, who skipped up immediately behind the coach, with their liveries all bedaubed with gold and silver, and clung as close behind each other as if they had done nothing else their whole lives. The fairy then said to Cinderella, "Well, you see here an equipage fit to go to the ball with; are you not pleased with it?" "Oh, yes," she cried; "but must I go in these nasty rags?" Her godmother then touched her with her wand, and, at the same instant, her clothes turned into cloth of gold and silver, all beset with jewels. This done, she gave her a pair of glass slippers, the prettiest in the whole world. Being thus decked out, she got up into her coach; but her godmother, above all things, commanded her not to stay past midnight, telling her, at the same time, that if she stayed one moment longer, the coach would be a pumpkin again, her horses mice, her coachman a rat, her footmen lizards, and that her clothes would become just as they were before. She promised her godmother to leave the ball before midnight; and then drove away, scarcely able to contain herself for joy. The king's son, who was told that a great princess, whom nobody knew, had arrived, ran out to receive her. He gave her his hand as she alighted from the coach, and led her into the hall, among all the company. There was immediately a profound silence. Everyone stopped dancing, and the violins ceased to play, so entranced was everyone with the singular beauties of the unknown newcomer. Nothing was then heard but a confused noise of, "How beautiful she is! How beautiful she is!" All the ladies were busied in considering her clothes and headdress, hoping to have some made next day after the same pattern, provided they could find such fine materials and as able hands to make them. The king's son led her to the most honorable seat, and afterwards took her out to dance with him. She danced so very gracefully that they all more and more admired her. A fine meal was served up, but the young prince ate not a morsel, so intently was he busied in gazing on her. She went and sat down by her sisters, showing them a thousand civilities, giving them part of the oranges and citrons which the prince had presented her with, which very much surprised them, for they did not know her. While Cinderella was thus amusing her sisters, she heard the clock strike eleven and three-quarters, whereupon she immediately made a courtesy to the company and hurried away as fast as she could. Arriving home, she ran to seek out her godmother, and, after having thanked her, she said she could not but heartily wish she might go to the ball the next day as well, because the king's son had invited her. As she was eagerly telling her godmother everything that had happened at the ball, her two sisters knocked at the door, which Cinderella ran and opened. "You stayed such a long time!" she cried, gaping, rubbing her eyes and stretching herself as if she had been sleeping; she had not, however, had any manner of inclination to sleep while they were away from home. "If you had been at the ball," said one of her sisters, "you would not have been tired with it. The finest princess was there, the most beautiful that mortal eyes have ever seen. She showed us a thousand civilities, and gave us oranges and citrons." Cinderella seemed very indifferent in the matter. Indeed, she asked them the name of that princess; but they told her they did not know it, and that the king's son was very uneasy on her account and would give all the world to know who she was. At this Cinderella, smiling, replied, "She must, then, be very beautiful indeed; how happy you have been! Could not I see her? Ah, dear Charlotte, do lend me your yellow dress which you wear every day." "Yes, to be sure!" cried Charlotte; "lend my clothes to such a dirty Cinderwench as you are! I should be such a fool." Cinderella, indeed, well expected such an answer, and was very glad of the refusal; for she would have been sadly put to it, if her sister had lent her what she asked for jestingly. The next day the two sisters were at the ball, and so was Cinderella, but dressed even more magnificently than before. The king's son was always by her, and never ceased his compliments and kind speeches to her. All this was so far from being tiresome to her, and, indeed, she quite forgot what her godmother had told her. She thought that it was no later than eleven when she counted the clock striking twelve. She jumped up and fled, as nimble as a deer. The prince followed, but could not overtake her. She left behind one of her glass slippers, which the prince picked up most carefully. She reached home, but quite out of breath, and in her nasty old clothes, having nothing left of all her finery but one of the little slippers, the mate to the one that she had dropped. The guards at the palace gate were asked if they had not seen a princess go out. They replied that they had seen nobody leave but a young girl, very shabbily dressed, and who had more the air of a poor country wench than a gentlewoman. When the two sisters returned from the ball Cinderella asked them if they had been well entertained, and if the fine lady had been there. They told her, yes, but that she hurried away immediately when it struck twelve, and with so much haste that she dropped one of her little glass slippers, the prettiest in the world, which the king's son had picked up; that he had done nothing but look at her all the time at the ball, and that most certainly he was very much in love with the beautiful person who owned the glass slipper. What they said was very true; for a few days later, the king's son had it proclaimed, by sound of trumpet, that he would marry her whose foot this slipper would just fit. They began to try it on the princesses, then the duchesses and all the court, but in vain; it was brought to the two sisters, who did all they possibly could to force their foot into the slipper, but they did not succeed. Cinderella, who saw all this, and knew that it was her slipper, said to them, laughing, "Let me see if it will not fit me." Her sisters burst out laughing, and began to banter with her. The gentleman who was sent to try the slipper looked earnestly at Cinderella, and, finding her very handsome, said that it was only just that she should try as well, and that he had orders to let everyone try. He had Cinderella sit down, and, putting the slipper to her foot, he found that it went on very easily, fitting her as if it had been made of wax. Her two sisters were greatly astonished, but then even more so, when Cinderella pulled out of her pocket the other slipper, and put it on her other foot. Then in came her godmother and touched her wand to Cinderella's clothes, making them richer and more magnificent than any of those she had worn before. And now her two sisters found her to be that fine, beautiful lady whom they had seen at the ball. They threw themselves at her feet to beg pardon for all the ill treatment they had made her undergo. Cinderella took them up, and, as she embraced them, said that she forgave them with all her heart, and wanted them always to love her. She was taken to the young prince, dressed as she was. He thought she was more charming than before, and, a few days after, married her. Cinderella, who was no less good than beautiful, gave her two sisters lodgings in the palace, and that very same day matched them with two great lords of the court.